So what happened next? | Turning my world upside down! 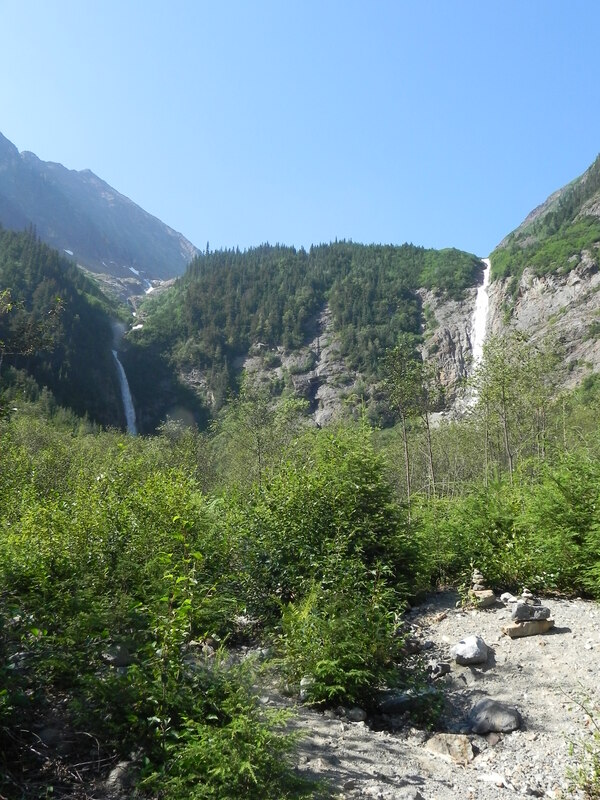 We drove south again towards Prince George, but stopped for the night in Smithers, camping in full view of Twin Falls, the remnants of a receding glacier on Hudson Bay mountain. The next day we continued east, then north, stopping at Fort St. James, located on beautiful Stuart Lake. The fort is a national historic site which was possibly the most important outpost of the Hudson’s Bay Company during the fur trade years in the west. Beaver, wolf, fox and other furs were considered of a very high quality in 18th century Europe. I was not aware that the goods had to be transported on land to the Pacific port of Victoria and then shipped south around the tip of South America to England and France. Look it up on a map and you will understand the magnitude of this enterprise! At any rate, we spent the day at Fort St. James where Leon even participated in betting on the chicken races. He won both times, betting on his lucky number 5. Boy could that chicken run!! We continued our travels to Prince George and then south to Barkerville where we planned to meet up with Elaine and Brent for a couple of nights. Barkerville was a busy gold mining town in the 1800s. The village is in good condition with re-enactors dressed in period costume taking us on historic tours. 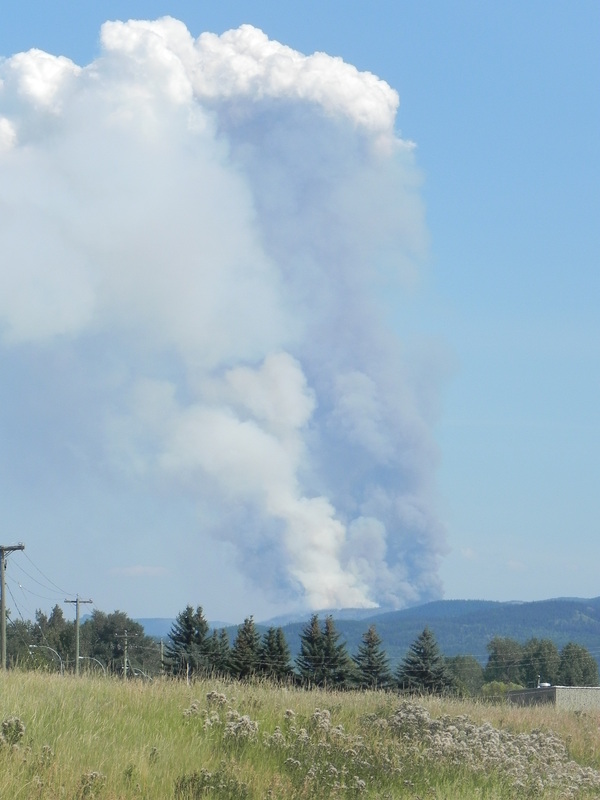 This grew to a large forest fire, somewhere near Houston, BC. We then moved on to Kelowna, stopping at Sheridan Lake along the way. Our trip south was marked by smokey skies as a significant forest fire had started in the Houston area a couple of days before. Kelowna has grown a lot since I last visited! It’s probably our most important wine region. Elaine told me that many of the trailer parks that used to exist for retirees have now been sold to make room for vineyards. We went to lunch at the Grey Monk Winery where I couldn’t get over the view, so similar to the Mediterranean coast, all tall hills and blue waters. The days were hot yet humid enough for large rainstorms on one evening. After a two day visit, we regretfully said goodbye and made our way back to the lower mainland where Leon’s family was waiting to spend some more time with us before we flew home. We cleaned our trusty Roadie thoroughly and left it in the capable hands of Leon’s sister and brother in law for the next year or so, when we plan to return to BC, possibly permanently. Below are my maps to show you where we travelled to this summer. The first length of the trip took about 7 days – Orleans, Ontario to Rockaway Beach, Oregon. The next part of the trip was from Rockaway Beach to White Rock, then we started our travels along the BC coast which included 12 different ferry rides. We began with the ferry from Tsawwassen to Sidney. After 8 days or so, we returned to Sidney. We explored Vancouver Island, driving north, taking a ferry to visit Denman Island and Alert Bay, ending up in Port Hardy where we sailed the Inside Passage to Prince Rupert and ultimately, Haida Gwaii. In the final part of the trip, we returned to the mainland taking a long detour north to Alaska. It certainly was a fun summer for you and Leon. You’re learning so much geography and history on your trips. Good on you both! Enjoyed following your vacation and your comments about US. Both countries are so similar but, of course differences also. Wishing you well as you return to teaching now. Sometimes I miss it, but do enjoy retirement so much. Thanks for sharing your trip! Thanks for your kind words. I am back at school and looking forward to a positive year, full of energy. First week down and all went well. I am also looking forward to retirement, however. Here it is Sunday and I have to prep. So I feel like I never get a 2 day weekend during the school year. I guess that’s why our travels are so important during the off times. It is always a little sad when your holiday ends, but once home and back in the routine, one does have fond memories of summer’s adventures. Thanks for sharing on your blog!